1:24th Scale Polished Pewter Mortar and Pestle. A Packet of Baby Soft Cotton Wool. A Packet of Cheif Two Moons, Bitter Oil. A Box of Blood and Stomach Pills by Parkinsons. A Packet of C.W.S. Health Salt. A Packet of Vaseline Camphor Ice. This item was sold in Chemist Shops. A Carrier Bag, advertising a Chemist Shop. Large Glass Clear Chemist Display Bottle, with removable top. Is 2" to the very top of the bottle lid. 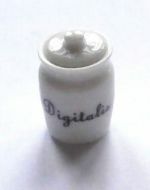 A Tall Lidded Ceramic Display Jar with the word "Digitalis" on the front. Small Clear Plastic Chemist Display Bottle. Stand 1 4/8th" Tall.